The Maurice "Rocket" Richard Trophy, also known as the Maurice Richard Trophy, is awarded annually to the leading goal scorer in the National Hockey League (NHL). It was donated to the NHL by the Montreal Canadiens in 1998–99 and is named in honour of legendary Montreal Canadiens right winger Maurice "Rocket" Richard. It was first won by Teemu Selanne. The current holder is Alexander Ovechkin of the Washington Capitals, who scored 51 goals during the 2018–19 season. The Maurice "Rocket" Richard Trophy was donated by the Montreal Canadiens to the NHL in 1999, and was first awarded at the end of the 1998–99 season. It is one of the newest of the NHL's trophies and is named in honour of the legendary right winger Maurice "Rocket" Richard, who spent his eighteen-season career with the Canadiens. He led the NHL in goal scoring five times and was the first NHL player to reach the 500-goal milestone. In 1944–45, Richard became the first player in NHL history to score 50 goals in one season, doing so in just 50 games, the latter feat achieved by only four other players since then. However, Richard never finished higher than second in points, his closest miss coming in 1954–55. The Art Ross Trophy given to the NHL's leading points scorer often wins the Hart Memorial Trophy as league Most Valuable Player. However, only Alexander Ovechkin and Corey Perry have won both the Richard and the Hart trophies in the same season; Ovechkin has accomplished this three times, in 2007–08, 2008–09, and 2012–13. Eleven players won the Hart in the same season in which they led the league in goals before the Richard Trophy was first awarded. Unlike the Art Ross Trophy, there are no tiebreakers for the Richard Trophy. As a result, it is possible for several players to share the award, such as when the 2003–04 season featured a three-way tie between 41-goal scorers Jarome Iginla, Ilya Kovalchuk, and Rick Nash. 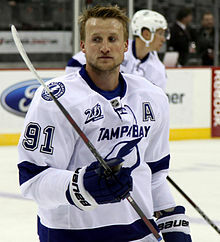 The second time there was a tie for this award was in the 2009–10 season, when both Sidney Crosby and Steven Stamkos scored 51 goals each to win this award. Rick Nash is the youngest player to have won the trophy, being 19 years old upon receipt. Alexander Ovechkin is the only player to have won the trophy at least three times; he won his eighth Richard Trophy in 2018–19. Only four other players (Pavel Bure, Jarome Iginla, Steven Stamkos, and Sidney Crosby with two trophies each) have won it more than once. 2004–05 No winner was named due to the lockout. Dinger, Ralph (2004). National Hockey League Official Guide & Record Book. Toronto: Dan Diamond. ISBN 0-920445-84-5. ^ "Maurice "Rocket" Richard Trophy history". NHL.com. Retrieved 2007-08-21. ^ "Maurice "Rocket" Richard Trophy history". Legendsofhockey.net. Archived from the original on 2010-04-25. Retrieved 2007-07-31. ^ "Hart Memorial Trophy history". NHL.com. Archived from the original on 2006-04-27. Retrieved 2007-08-22.